IDF reports riots near Gaza fence of past two days particularly violent, including use of marbles, firecrackers, and explosive devices. Three terrorists attempted to reach the fence in southern Gaza last night with the intention of planting explosive charges on the fence. An IDF force spotted the terrorists, followed them, and at one point snipers from a special unit hit the three and killed them, and a large cache of explosives was discovered this morning. 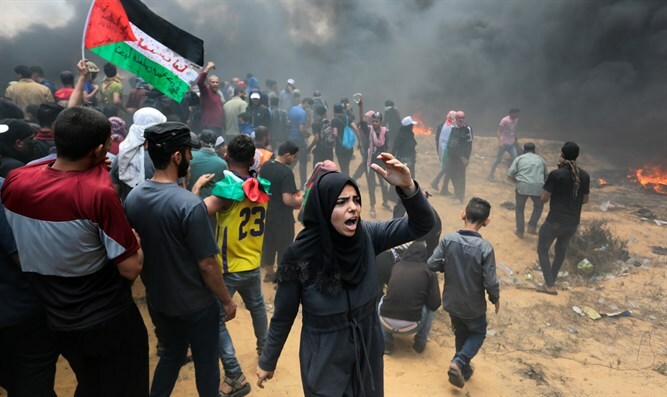 In the afternoon Arabs under the protection of women and small children tried to evacuate the bodies, while Arab journalists hovered in the area hoping to photograph IDF soldiers shooting women and children. The IDF refrained from shooting and used only riot control measures. It is known to the army that events of the last two days were particularly violent, including use of marbles, incendiary kites, and fragmentation charges. During the course of the day, Hamas tried to shoot down military drones with gunfire, and in the past few hours there have been several confrontations along the fence.